Situated in Okrug Gornji, on the Island of Čiovo, Apartments Bartulić is located in a secluded location, surrounded by untouched nature. Closest beach is just 20 metres away. The UNESCO-protected city of Trogir is located 4 kilometers away. All accommodation units at Bartulić Apartments offer air-conditioning and free internet access access. A seating area with a sofa and satellite television is available, while the well-equipped kitchenette comes with a dining area. Private toilet presents a shower and the balcony presents a view of the sea. A 1-km long pebbly beach featuring sea sports amenities, clubs, dining establishment and shops can be found 2 km away. Nearest restaurant can be reached in a couple of steps, while a grocery shop is 200 metres away. The town of Trogir offers many sites, for instance the Basilica of Saint Lawrence and the Trogir Museum. The town of Split can conveniently be reached by ferry that stops 4 km from Apartments Bartulić. Local buses stop 500 metres from the apartments, while an intercity bus stop can be found in Trogir, 4 km away. Split Flight terminal, located in Kaštele, is 7 km away. Apartments Niko ~0.1 km, Okrug Gornji price per day from € 55 Apartments Niko is a self-catering accommodation situated in Okrug Gornji, just 200 metres from the beach. Gratis wireless internet access is available throughout and there is an on-site car parking space for visitors arriving by car. There is a well-equipped kitchenette with a stovetop and a fridge. The private toilet comes with a bath and a shower. This accommodation unit is 2 km from the Stjepan Radic Promenade, where guests will find a beach and some shops. Trogir ( ~ 3.1 km ): 563+ accommodation units. Arbanija ( ~ 3.7 km ): 388+ apartments. Seget Donji ( ~ 4.2 km ): 108+ apartments, 94+ villas, 2+ hotels. Slatine ( ~ 5.8 km ): 251+ accommodation units. 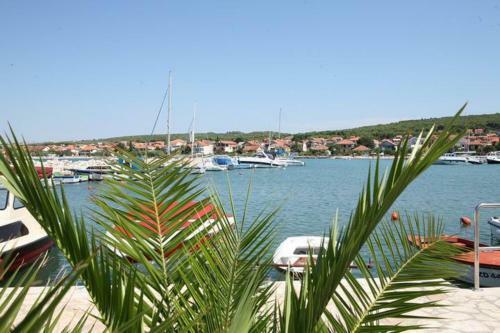 Beach Okrug Gornji, Ciovo ~ 0,9 km from Apartments Bartulić Sandy beach: ideal for families, recommended for young people, with restaurant, with caffe bar, equipped with showers. Excellent choice of watersports. Beach Mavarstica, Okrug Gornji ~ 1,1 km from Apartments Bartulić Sandy beach: ideal for families, recommended for young people. Beach Pantan, Trogir ~ 3,5 km from Apartments Bartulić Sandy beach: ideal for families, with caffe bar, equipped with showers. Beach Medena, Seget Donji ~ 4,9 km from Apartments Bartulić Gravel beach: ideal for families, recommended for young people, with restaurant, with caffe bar. Excellent choice of watersports. Beach Kava, Slatine ~ 8,8 km from Apartments Bartulić Gravel beach: ideal for families, with restaurant, with caffe bar. Restaurant Mediteraneo, Trogir Guest reviews: 8,5/10 ~ 2,8 km from Apartments Bartulić Address: Ulica Kralja Tomislava 70, Trogir. Cuisine: Croatian cuisine.